My granny who was an annoying old woman from the north of Engand said, ‘There’s nowt in old age’. She was right about that. Watching my own, once capable, mother trying to be helpful and to do things she can no longer do, is exasperating. Her poor memory and hearing mean that I am constantly being asked to repeat things or correct misconceptions. Modern medical science and better nutrition means that we are all living to greater ages whilst the birth rate, particularly amongst the more educated, is falling due to delayed motherhood or failure to conceive. I do not relish a future where society becomes dominated by its senior citizens even though I belong to this group myself. This is a poem based on a news item earlier this year. It is a work in progress. buying sun hats for the children. about to be taken to hospital. he jumped from the hotel balcony. I took a day off work today as I had some time owing, and I had to take my mother to an appointment with a podiatrist. The prospect of not having to go to work is becoming increasingly attractive. Time is worth more than money. With travel prolonging the working day, and unrealistic expectations from the company I work for, I find the financial rewards less of a pull. I have reached the age at which men as well as women officially become OAPs, so it is time to start doing the things that I really want to do. I pity those whose future holds working until seventy years old or more. I’m working hard to catch up with work for my course, Design and the Web. When I tried to publish my review of week 1, the image wouldn’t download. Apparently that was because I had used an absolute rather than a relative address i.e. I had linked it to the hard drive on my computer. I did, however, manage to do links to the Open University home page and to this blog. I can also do links to take you up and down pages. For my next trick I will attempt to do a link here. I want to link my blog to Kamsin’s blog. I will try using her name, Kamsin as a link. After spending the last week putting the final touches to a portfolio of poems for an end of course assessment, I’m feeling a sense of lost. The following is a poem that I wrote after my eldest son, daughterin-law, and grandson returned to Thailand, in 2003, after having their marriage blessed here in England. I felt the same way when my daughter went to China and, more recently, when I returned home after seeing her off to Bosnia. where the spaces in which they moved are. 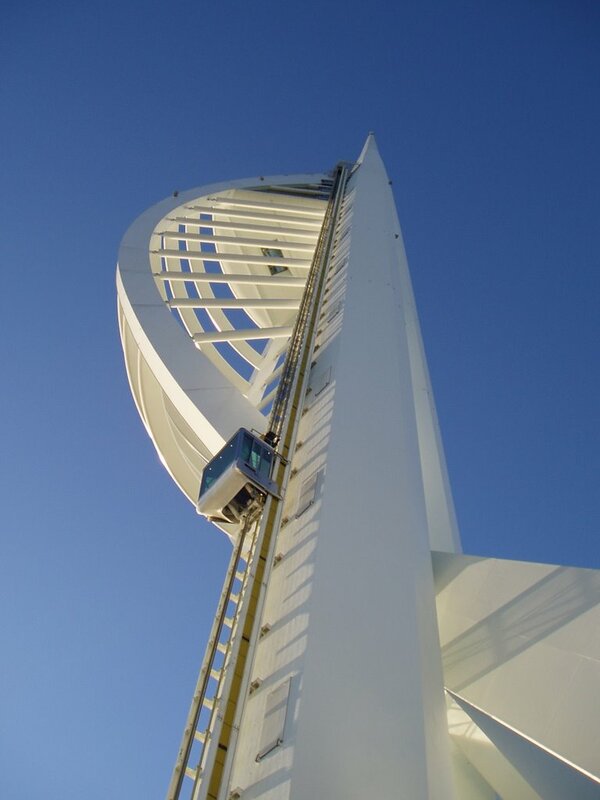 It had been my intention to climb the Spinnaker Tower, but that will have to wait for another visit. I loved the atmosphere at Gunwarf Quays: I’m always drawn to the sea, and the Spinnaker Tower is an amazing landmark. I had one of moronic moments when I was almost there. I turned off the M27 too soon, and found myself heading for the wrong part of Portsmouth. When stopped on a dual carriageway, and rang Janine who has an apartment in Gosport, with a view of the Spinnaker Tower. She said that she has no idea how I could get to Gunwarf Quays. She’s even worse than me which takes some doing. Fortunately, I came to a roundabout where I was able to turn round, and rejoin the motorway. I can drive long distances on motorways, have been to Africa and the Far East, but when it comes to finding places in towns and cities, I panic. Imagine my relief, when I saw the Spinnaker Tower; the perfect guide to my destination.